"Four score and seven minutes ago, the boys brought forth to this playground, a dodgeball game, dedicated to the proposition that all girls have cooties and are icky. Now we are engaged in a great civil war, testing whether that dodgeball game can long endure if the girls complain to Miss Johnson that we won't let them play. We have come together to dedicate a portion of this dodgeball game to the boys, who are awesome. It is altogether super sweet that we should do this." Whoa. Gave you chills, didn't it? We're not saying that young Abraham Lincoln strolled out onto the recess fields and uttered these words to his schoolmates, but imagine if he had. It would have been the most inspiring game of dodgeball ever. The majestic fields filled with fallen heroes who couldn't duck out of the way fast enough when the ball was hurled at them, and the proud heroes who still stood after catching the ball that flew their way. Now just imagine that kind of inspiration today with your own little aspiring Abraham Lincoln. 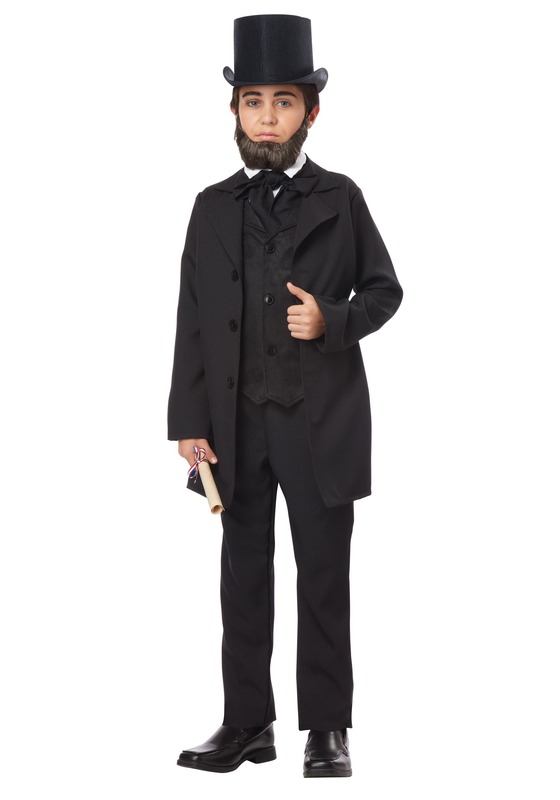 Whether it's filling up a Halloween bucket with candy or wowing the crowds at a school play, this Boys Abraham Lincoln Costume fits the look with plenty of presidential goodness. It's a costume that's good enough for Mount Rushmore! 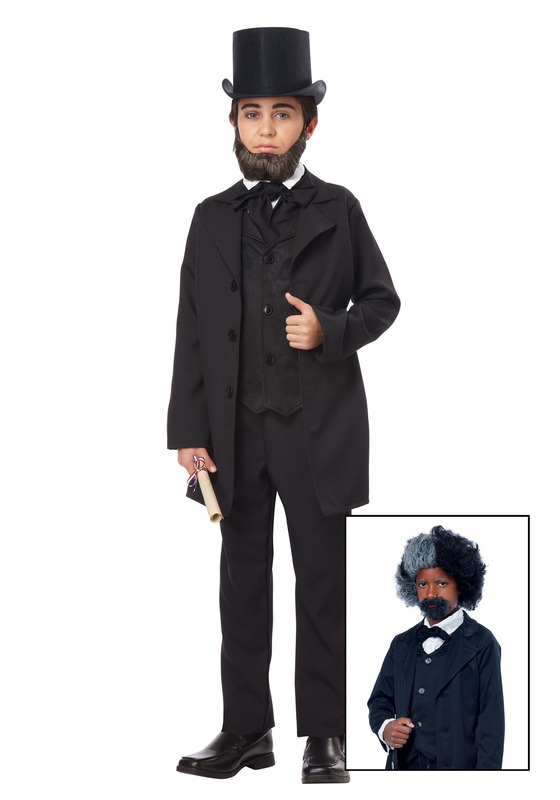 This classic Abraham Lincoln costume comes with a Jacket/vest combo, bow tie, and the tall black stovepipe hat. The 100% interlock knit polyester fabric holds up well in any surroundings, and has sewn-in black vest pockets just in case he needs to carry a speech with him! You'll need his own black pants to complete the style, and a beard to replicate President Lincoln's iconic style (sold separartely.) 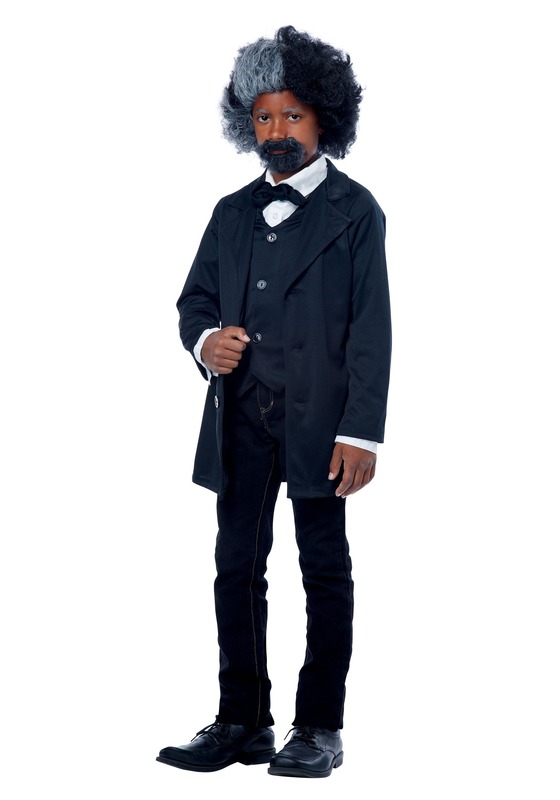 Pro tip: this costume ensemble works great for other historical figures, too, check out the second picture to see our model depicted as Frederick Douglass!